After the better part of two years on the festival circuit AMONG WOLVES is finally reaching theaters Friday with a week long theatrical event in Chicago beginning at the Music Box Theater where they will be doing screenings, panels and other events celebrating the film. The film then hits VOD and DVD on the 12th. 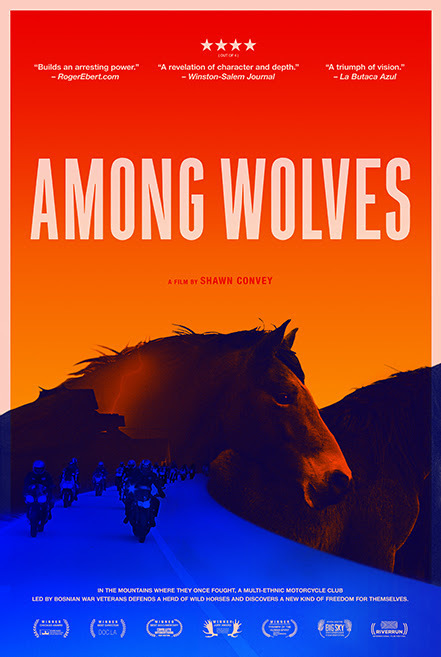 The film follows the members of the Wolves motorcycle club in Bosnia. made up of mostly war vets the club has taken it upon themselves to watch over the wild horses in the area. The horses were the vets constant companions during the war and they feel a camaraderie with them since they went through the same things the vets did. Once on the brink of disappearing the herd of horses has doubled in size since the men started caring for them. Observational in nature AMONG WOLVES doesn't just focus on the horses but the lives of the men as well. The towns and villages where they live are still reeling from the effects of the war which destroyed the factories and income sources to such an extent that most young people are leaving if they get the chance. As for those who stay its a struggle for survival. Leisurely paced the film moves like life in this part of Bosnia. Men work, hang out and spend time with the horses. At first it can seem a little taxing but once you click with it the film reveals all sorts of little insights to not only the lives of the man and horses but to life on a larger scale. Filled with beautiful images of the horses in the wild this is a film you'll want to see on the big screen if you can. If you can't do try to make time to see it when you can just sit and watch it without distractions.